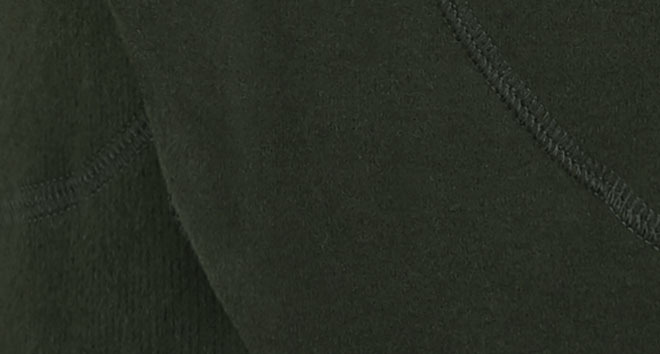 Get cosy in this soft and insulating hoody in luxury Italian Fleece, which is on hand to keep you warm. With comfortable flat seams, an asymmetric ribbed hem, and a oversized collar, its time to block out the chill. Composition: 45% Acrylic, 45% Cotton, 10% Elastane. Wash at 30°C (86°F) on reduced spin. Do not bleach. Do not dry clean. Do not tumble dry. See care label for additional information. Invigorate Luxe Hoodie is rated 4.8 out of 5 by 34. Rated 4 out of 5 by Canadian skier girl from Comfortable and Soft I bought this to go over my tank and leggings on the way to barre. It is , however, dressy enough to wear with jeans or leggings. It hangs nicely and I've already washed it several time and it has retain it's shape and colour. I would buy this in other colours. The high neck is also great to cinch in our cold Canadian Winters. Rated 5 out of 5 by JKrunner from Perfect hoodie! The rest of these reviews are right. This hoodie is everything. Not too heavy duty so you don't get too hot. Perfect length to cover the bum for leggings. Flattering. Buying another color. It is amazing. Rated 4 out of 5 by Enchanted from Lux invigorate hoodie This hoodie is soft and stylish! My only complaint is that there are no pockets. It’s the perfect transition piece from winter to spring but would really be perfect with pockets! Rated 5 out of 5 by Mika333 from Super comfy After reading so many reviews I decided to purchase this and this is a best decision! A great layer on my casual days! Rated 5 out of 5 by Movement from Luxe hoodie As with everything Sweaty Betty my new hoodie is beautiful. The quality is excellent and the style is flattering and it’s warm and cozy. Rated 5 out of 5 by working out!! from super soft and comfy i like the way it fits...super soft and comfy. Keeps me nice and warm out on a walk on a cold day...iuf the wind comes up the hoodie is great! Rated 5 out of 5 by Momof4 from A live-in piece After reading the reviews on this hoodie, I decided to add it to my order... my only disappointment is that I only have one! So soft, fit is great (I have long arms) and I had a baby five months ago and this makes me feel more chic than my usual mom sweatsuit gear! Rated 4 out of 5 by Nancy20850 from Great fitting hoodie I got this hoodie in a size large. Normally I am a medium, size 8 to 10, but this is quite slim. The large is more flattering and easier to move around in. I was a little disappointed in the blue color. Deep blue can be so beautiful, but this is a typical “sweatshirt navy blue” color. The fabric is wonderful and so soft. Nice tailoring and drawstring neck/hood. Just like the website shows it. Debatable whether any hoodie is worth $165 but I’m happy.